Cape Town is still achieving the highest property prices 02 Apr 2019 Despite the notably slower property market above R20 million, the Western Cape continues to achieve the highest overall prices in the country. This six bedroom, six bathroom villa in Camps Bay, Cape Town, has expansive indoor and outdoor entertainment areas, a rim-flow pool, a second pool, gym, sauna and steam room, and more. It is on the market for R29.5 million - click here to view. Samuel Seeff, chairman of the Seeff Property Group, says that the economic downturn has affected the various sectors of the property market in different ways. While the sub-R1.5 million (below R3 million in the luxury areas) price band remains fairly active, there was a notable slowdown in R20 million-plus value sales as "buyers take time out and wait and watch as things unfold in the country", he says. This three bedroom, three bathroom home in Camps Bay, Cape Town, has mountain and sea views, floor-to-ceiling windows, a separate one bedroom, one bathroom flatlet, a study, pool and more. It is selling for R32 million - click here to view. While this top end of the market is down by about 50% from the highs of 2015 to 2017, Propstats data shows that in Cape Town, just under R1.6 billion in super luxury sales were concluded last year, about R1 billion thereof on the Atlantic Seaboard alone. Seeff concluded 10 of the highest value sales in Cape Town last year with a combined value of around R380 million, most to local buyers. This five bedroom, five bathroom home in Clifton, Cape Town, has a rim-flow pool, mountain garden, cinema room, gym, staff accommodation, elevator and more. It is on the market for R172.5 million - click here to view. The three highest value sales concluded in Cape Town include R80 million in Bantry Bay (sold by Seeff), R62 million in Constantia and R57 million in Clifton, R55 million in Fresnaye (sold by Seeff) and R41.5 million in Mouille Point (joint Seeff sale). Seeff also sold a vacant plot in Fresnaye for R28 million. This north-facing home in Llandudno, Cape Town, has six bedrooms, five bathrooms, cinema and games room, three reception rooms, an entertainment and pool deck. It is selling for R28 million - click here to view. Camps Bay achieved the highest volume of R20 million-plus sales with eight units sold and only managed a highest price of R33 million as the suburb experienced one of the slowest sales years in recent times. Additionally, Seeff also concluded three sales at the Kerzner Estate in Leeukoppie at record prices of R30.5 million to R37 million. This expansive five bedroom, five bathroom home in Fresnaye, Cape Town, has numerous living and entertainment rooms, a pool and more. It is on the market for R65 million - click here to view. The highest prices achieved on the Atlantic Seaboard include: Clifton: Five R20 million-plus sales, with a highest price of R57 million for a house in Kloof Road. Bantry Bay: Five R20 million-plus sales, with a highest price of R80 million for an apartment sold by Seeff. Fresnaye: Four R20 million-plus sales, with a highest price of R55 million for a house in De Wet Road sold by Seeff. Camps Bay, including Bakoven: Eight R20 million-plus sales, with a highest price of R33 million for a house in Medburn Road. Waterfront: Two R20 million-plus sales, with high prices of R20 million (Parergon) and R26.5 million (No 3 Silo). Mouille Point: Three R20 million-plus sales, with a highest price of R41.5 million for a unit in East West (joint Seeff sale). 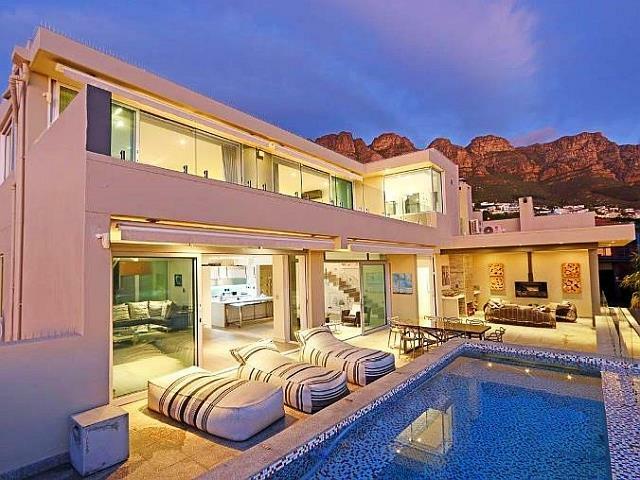 Llandudno: Three R20 million-plus sales, with a highest price of R57.5 million. This home in Constantia, Cape Town, has four en-suite bedrooms, a study, various reception and living areas, staff accommodation and more. It is on the market for R25 million - click here to view. Cape Town's City Bowl is also increasingly seeing high value sales with two units sold in Higgovale with a highest price of R23 million and two in Oranjezicht with a highest price of R28 million. Most of these high-value sales were cash deals, according to Ross Levin, Director for Seeff Atlantic Seaboard, Waterfront and City Bowl. Only about a handful were to foreign buyers, such as two sales to UK buyers, being for R26 million property in Bantry Bay and R28 million in Camps Bay/Bakoven. While there is still demand for high-end homes in top locations, buyers are now negotiating strongly. The upside, Levin says, is that there has been a notable rise in new listings, giving buyers an excellent choice of stock. At the same time, sellers are beginning to look at lower offers. While there were no high-end sales recorded for Bishopscourt, some seven units sold above R20 million in Constantia Upper. James Lewis, MD for Seeff South Suburbs and Hout Bay notes that here too, listings have risen notably over the last two years, giving buyers a much broader choice and allowing for more room to negotiate. This six bedroom, five bathroom home in Bryanston, Sandton, has elegant reception rooms, a bar area, wine cellar, tennis court and more. It is on the market for R22 million - click here to view. In the country's financial powerhouse areas of Johannesburg and Sandton, there were only just over a dozen high-value sales in the top-end areas with a combined value of just over R380 million. More than half of these were in Sandhurst, although only with a highest price of R30 million. The highest value sales were recorded for Bryanston at around R33 million to just over R58 million.